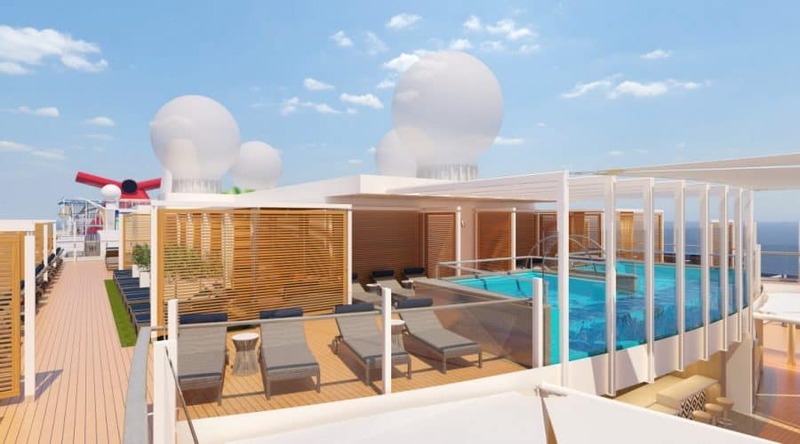 Carnival Mardi Gras which is a new class cruise ship coming to Carnival Cruise Line in 2020 will feature new premium suites and a new secluded retreat. The new retreat will debut on the Mardi Gras in 2020 and it will be called Loft 19. 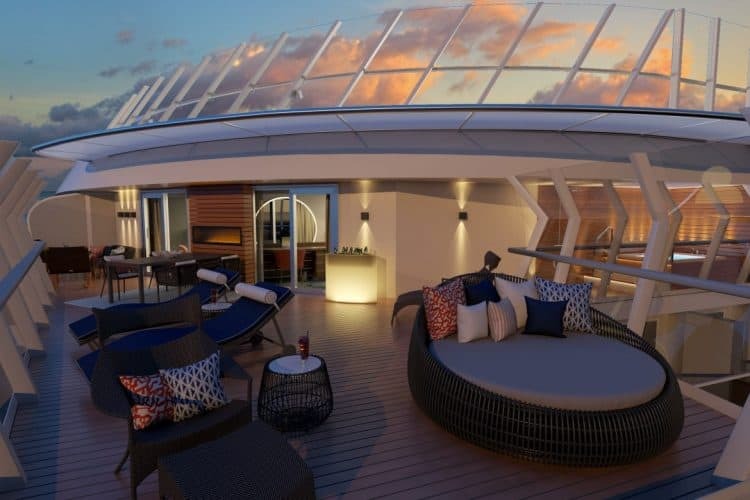 The exclusive space will be located on the highest deck of the ship and inspired by some of the world’s best resorts. There will be a full bar service and a private pool. Sun loungers and cabanas will be located around the pool too. The cabanas will be stocked with fresh fruit, chilled towels, robes, and guests can even get lunch delivery along with concierge service. Those booked in the new premium Excel suites will get priority reservations. 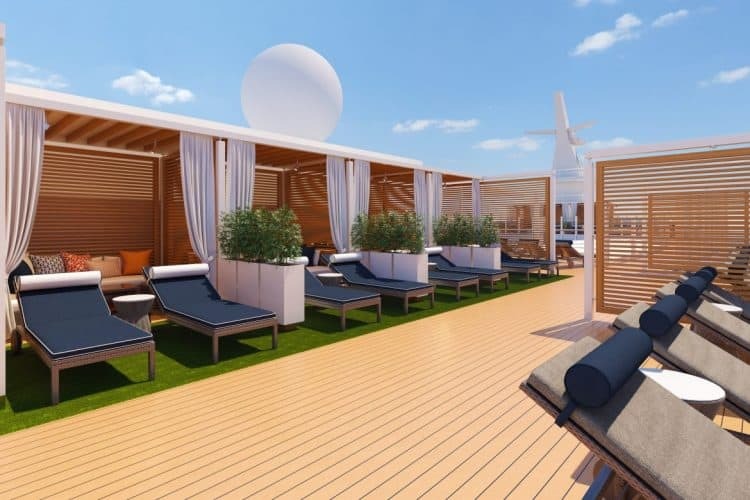 It was also revealed that the new cruise ship will have 32 suites across four categories. 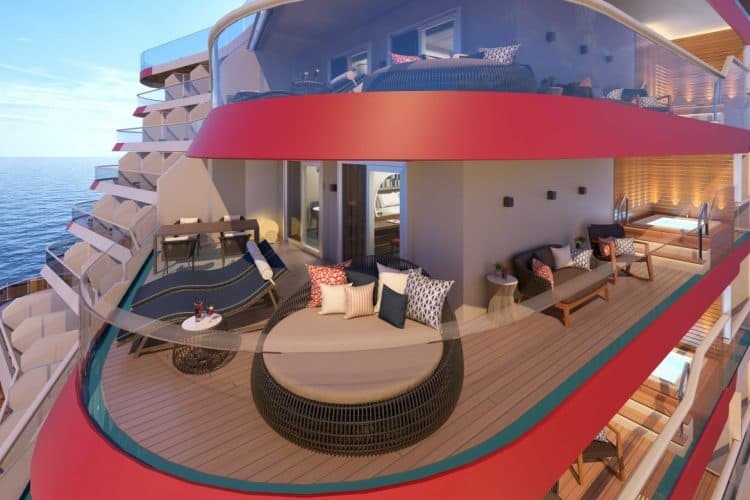 There will be six Carnival Excel suites on decks 10, 11 and 12 which includes expanded space for dining. The will be twelve Carnival Excel corner suites on the port and starboard side of the ship with wraparound balconies and even more space. Twelve Carnival Excel aft suites will provide large wraparound balconies with lush ocean views. There will be two Carnival Excel presidential suites located on deck 17 and the largest in the fleet. Carnival Cruise Line has already revealed details about the Mardi Gras staterooms right here. The ship will also feature Ocean suites, Havana suites, family harbor suites, and cloud 9 spa suites. Many of these were first introduced on the Vista-class cruise ships. All accommodations on the Mardi Gras do come with USB outlets. The new ship is currently under construction at the Meyer Turku shipyard in Finland. The maiden voyage will depart Copenhagen on August 31, 2020. The ship will be around 180,000 gross tons once completed. The cruise line also announced today of the iconic Family Feud TV game show that will be part of Mardi Gras’ entertainment offerings.